Aye, but when you are dying of thirst in the desert, I’m sure camel pee seems mighty attractive. Not a positive , just a mere hindrance . As we were heading into untrodden territory , no one really knew what to expect . No one really seemed to know what do the day after the vote . This isn’t untrodden territory. The whole world were looking on asking ‘W.T.F’???? So...remind me. All going to plan is it? ?? Now stop exaggerating , I never compared it to World war 2 !!!!!!! I merely stated that not having a trade deal will just be a hindrance to trading , rather than causing the cessation of trade completely .........and you made a WW2 reference !!!!!!!! I think that was true Max immediately following the referendum but at the moment there are some members of the Keep the Sheep Asleep Party on this forum who know exactly how we should proceed. Yes that is true which makes all those promises made by Johnson, Fox, Gove, Farage etc. all the more contemptable. Nobody knew what was going to be achievable but their wish list was presented as facts. Well we know the facts now! Due to the nature of my business I do a lot of import/exporting on a small scale, often not more than a couple of packing cases at a time. To make things easier I belong to a group of other small scale import/exporters operating in the same areas. By being a group we get preferential rates and some influence when getting onboard faster routes. We also get discounts from shipping agents. Personally I find most of the members of the group obnoxious jerks and they probably feel the same way about me. But as a unit we are strong and get deals that none of us could get individually. In other words it benefits us all to be part of that group and just makes sound business sense. My point? Pretty obvious I would have thought. That was, of course, how the EU started, with the Common Market as a a facilitator of trade between member nations. Had it stayed that way, rather than morphing into the political behemoth it has now become, Brexit would probably have been neither necessary nor desirable. What? And the Remainers mantra, 500000 unemployed, after Brexit we would have a recession, the cost of borrowing would go up, national security would be jeopardized , house prices would fall significantly etc weren't presented as facts? The Treasury has recorded the biggest January surplus since records began, raking in £14.9billion more than Government spent. 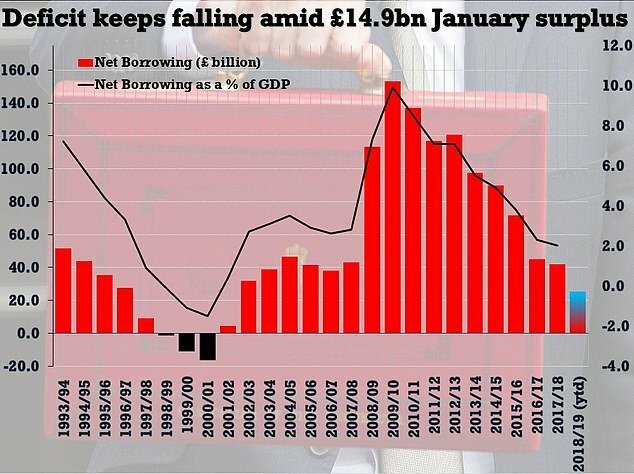 Borrowing has fallen to the lowest level in 11 years as the deficit continues to fall despite contingency measures taken for Brexit. Knowing what is out there and the experience of the other 160 odd non-EU members, isn’t.